Krusty™ is a soil conditioner for use on all soils, based on fully biodegradable components, non-ionic surfactants and polymers, complexed with organic and amino acids. Aids in water penetration, infiltration, and reduces run-off. Improves water distribution and depth of moisture penetration. 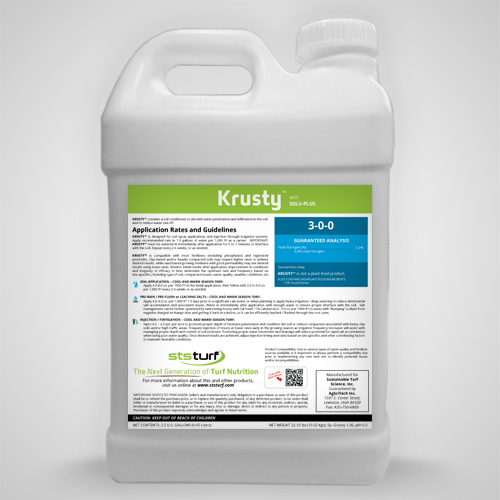 Organic and Amino Acids in Krusty™ may enhance nutrient availability and microbial activity. Contains no salts – Very stable at a low pH. Active Ingredients: natural polymers, and derivatives. Krusty™ is not a plant food product. This environmentally friendly product can help with improved water penetration, reducing run-off when implementing water reduction practices, delivering water deeper, more efficiently, and more uniformly. Use of patent pending technology during the manufacturing process, provides a product rich in organic acids and aminated compounds to complex the biodegradable components and polymers. Both STS Wetting agents can improve solubility of nutrients and their uptake, while also stimulating microbial activity. Injection/Fertigation Rate / Acre 0.5 - 2.0 qts.